Drive assessment and latency management technology is built into ATTO RAID adapters and storage controllers. DriveAssure provides bounded latency through proprietary algorithms and user controls to prevent premature drive failures and slow downs, ensuring uninterrupted access to data. Through periodic drive scans, DriveAssure searches for bad sectors or slow spots in your disk drives and repairs them without failing the drive, preventing the loss of critical assets. A slow drive in a storage array can lead to delays which increase real or perceived response time beyond what is desired for users. These delays can lead to unwanted behavior such as dropped video frames. DriveAssure compensates for situations when a drive in a RAID Group does not respond within a specified period of time to keep data moving smoothly within a guaranteed latency response time. If all attempts at preventing a RAID Group from going offline have failed, Data Recovery Mode attempts to access data in an offline RAID Group. There are several methods available to access drives including forcing a rebuild to continue so data can be copied to a new RAID Group. Enlist a good data management plan which includes ATTO RAID products to ensure your data is safe. IT managers and finanical institutions need assurance that data is securely backed up and RAID groups are online without unnecessarily running in degraded mode. Broadcast provides are highly concerned with data loss which can negatively impact play-to-air environments. Video on demand providers need constant (24/7) access to their media. Video editing customers can't afford to have projects interrupted because of dropped frames, or data loss due to premature drive failures and the time and expense involved in replacing those drives. DriveAssure is a specialized drive assessment and latency management feature, available on ATTO Technology Inc. ExpressSAS RAID adapters that provides bounded latency through proprietary algorithms and user controls. 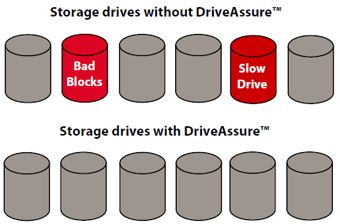 DriveAssure prevents premature drive failure and slow downs to ensure uninterrupted access to data. Proactive Measures: Unlike competitive products that fail a drive after a few unsuccessful retries, DriveAssure initializes (scrubs) and perorms periodic, latent drive scans to search for bad sectors and repairs them prior to a catastrophic failure. DriveAssure has built-in intelligence that performs parity verification and regularly monitors drive I/O performance. Rebuilds , when needed, are automatically continued on error. Corrective Measures: During normal operation, proprietary algorithms handle errors on-the-fly on drives due to slow spots or bad sectors. 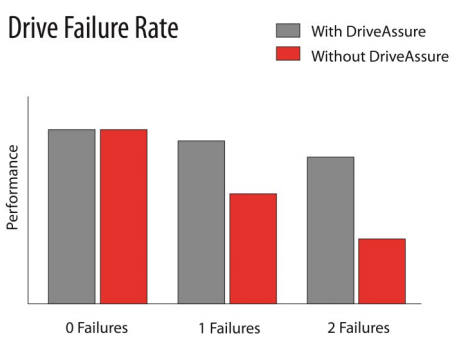 Through active monitoring of drive response times, retries of reads and writes, and alternative methods of data generation, DriveAssure makes certain that data is returned without failing the drive. Systems run longer, faster and smoother with uninterrupted data transfer. The potential for lost data or dropped frames is significantly minimized. Unnecessary drive replacements are eliminated, saving time and money on new drives and the labor involved with initializing and rebuilding RAID groups. With a lower occurrence of drive failures, bandwidth is directed to where it is needed most - application performance - not RAID group rebuilds and data backups. Latency is defined as the time between a request and a response. In a storage system utilizing an ATTO Technology Inc. RAID product, it is the time from when a workstation or server application issues a request for data from storage to the time that the ATTO RAID product return a response from the drives. Latency is not throughput. Throughput, typically measured in MB/second, is concerned with how quickly data can be moved to and from the drives. Latency is concerned with how smoothly data can be transferred. For example: If you transfer 1000MB of data in 100 seconds, the throughput is 10MB/sec. But this tells you nothing about how long it takes to read or write 1MB of data. Latency is measured by how long it takes to complete reads and writes to disk storage. Some may take serveral seconds, an eternity to many applications, while some may execute much faster. In a storage system, latency is impacted by all aspects of the network topology, from host adapters to the drives themselves. When ATTO RAID products are used, they not only minimze latency through pre-fetching, caching and early response technologies, ATTO also has proprietary algorithms to minimize the impact of drive latency. 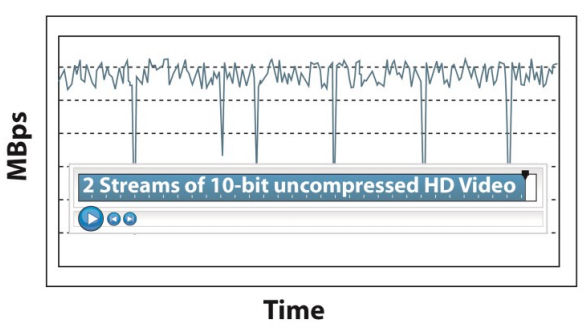 Throughput alone is not an accurate indicator of system performance for video applications. Latency introduced via a slow drive or intermittently slow drive in a storage array if left unmanaged will lead to reduced system performance. 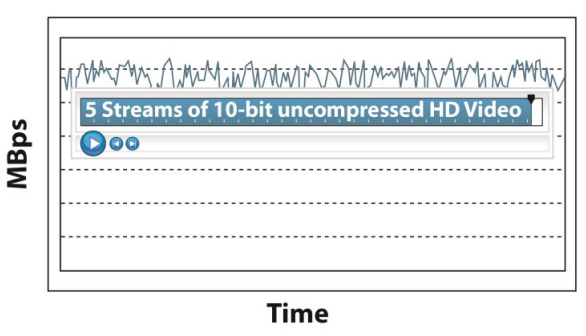 Figure 1 is an example of how reads and writes with larger than usual delays dramatically reduce the total available stream count even through there is ample throughput. Figure 1: Latency Response without DriveAssure. Unmanaged drive latency results in lower realtime performance. ATTO ExpressSAS RAID products with DriveAssure technology, for parity and redundant RAID levels compensate when one drive in a RAID group does not respond within a specified period of time. The data from a slow drive can be generated using the parity or redundancy information from the rest of the RAID group, with only a nominal change in throughput. 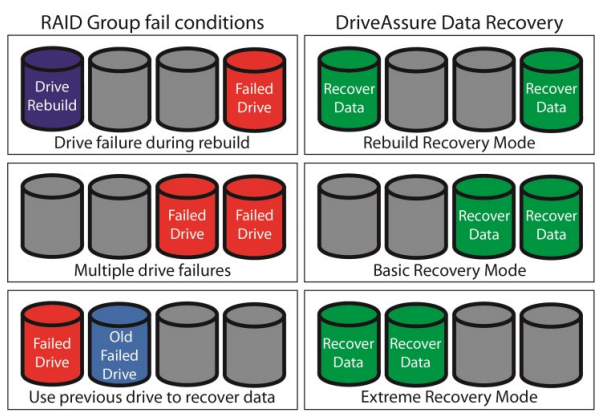 Figure 2 shows how ATTO RAID technology efficiently manages reads and writes, forgiving intermittent drive problems while keeping data moving smoothly. Figure 2 Latency Response with DriveAssure. ATTO RAID products have the ability to cap latency at a user specified level resulting in up to an 80% improvenment in latency response whten compared with the competition. ATTO DriveAssure with guaranteed latency enables the fastest low latency data transfers while preventing premature drive failures and slow downs, efficiently utilizing all avaiable drive bandwidth. Enlist a good data management plan which includes ATTO RAID products. Your drive has failed, now what? The capacities available in dish drives are constantly on the rise, with greater capacity comes greater risk of a second or even third drive failure during a RAID group rebuild. If this is the case most RAID products will fail the RAID group and make it offline making your data inaccessible. There are companies that can help you to recover data if this happens to you, but what if your RAID product had this recovery capability built in? Is it really a drive failure? There are other methods to determine if a drive has actually failed, all should be explored before using any data recovery program. Why does a RAID group go offline? Forces a rebuild to continue, even when errors are present. When complete, the Raid group is placed online and all data can be accessed; however, data needs to be verified to confirm that it is intact as a drive failure may have damaged some portion of data. Attempts access to a RAID group using any drive that was the member of the RAID group - not all data may be recovered from a failed disk. This gives you the ability to attempt to copy a portion of your data to a backup in the event of multiple drive failures. Is an advanced mode which allows RAID group access using any drive that may at some time been part of the RAID group, in the event of multiple drive failures. Data may be beyond recall depending on the failure mode of the drives in question but attempts will be made to give you access to all remaining RAID group data. All recovery modes should be used with care as the are powerful tool which is misused could cause additional problems. Default access is read only, but write access is also available so the file system utilities can be executed. ATTO DriveAssure with Data Recovery Mode attempts to keep your data protected even when catastrophic events occur with disk drives. Enlist a good data management plan which includes ATTO RAID products to ensure your data is safe.